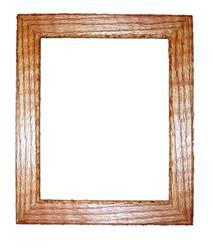 SOLID OAK FRAMES FOR STAINED GLASS PANELS. After equipping one of these frames with hooks for hanging, you will be able to cause a mild sensation by displaying your favorite stained glass panel in front of a window or other light source. Deep rabbets allow you to install leaded glass as well as foiled work. Solid oak, sanded and ready for stain, varnish or polyurethane. All of these frames are perfectly suited for use as mirror frames such as one would find in a Victorian style decor. An oak mirror frame would fit right into the decorating scheme in one of those brass and oak accoutered bathrooms with the claw-footed bath tub. This frame is much more robust than a standard picture frame, and is offered with the stained glass craftsperson in mind. The overall circle is 8-2/3" in diameter, and the space in which your stained glass panel will sit is 6-5/8" across. 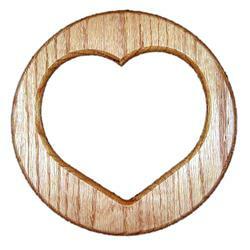 The heart-shaped area visible to the admirer of your finished piece is 6" across. Wooden Frame - 8" x 10"
This frame is much more robust than a standard picture frame, and is offered with the stained glass craftsperson in mind. The overall dimensions are just over 10" x 12", and the space in which your stained glass panel will sit is 8" x 10", with just 1/16" of extra wiggle room. The area visible to the admirer of your finished piece is 7-3/8" x 9-1/4". This frame has a glass opening of 13-3/4" across, and is intended for use with a standard clock movement and hands. This frame works with our clock kits #4833 and #4844. You will find that most stained glass clock patterns are made for the pendulum clock, but can be modified to fit this shape. You will find clock numerals in our page about jewelry findings. Most people find that having numerals on a clock make it easier to tell time.